Forget about the stultifyingly inane Family Circus or the juvenile Hagar the Horrible, for me there are only a few comic strips that were worth reading: The Far Side, Calvin and Hobbes, Boondocks. And head and shoulders above the rest: Doonesbury. More than merely humorous and topical, the sharply acerbic wit of Garry Trudeau not only captures the social and political pulse of America, but influences it as well. When the Washington Post suspended the strip for a month in 1979, even Senator Bob Dole lamented its loss saying, "We've lost our best source of what is going on in Washington." Amen to that! I've always felt that Trudeau's "journalism" was more valid and valuable than most news reports. I'd lost track of Doonesbury for a while--the downside of not subscribing to a daily newspaper (the L.A. Times is completely unreadable and they don't deliver the Washington Post in Los Angeles...), but the must-read strip is available online via Slate. So I've signed up for it to be delivered to my e-mail inbox daily. So now I can be all caught up with the lives of Joanie and Rick, Mike and B.D., Zonker and Duke--as well as enlightened by Trudeau's insightful and incisive portrayal of current events and pop culture. 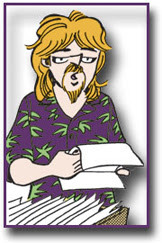 Amazingly Doonesbury has been going strong for 35 years. Here's to another 35!